Space shuttle Discovery touches down on Runway 15 at the Shuttle Landing Facility at NASA's Kennedy Space Center in Florida to end its final mission - STS-133 - on March 9, 2011. Landing was at 11:57 a.m. EST. CAPE CANAVERAL, Fla. – As the space shuttle Discovery glided toward its final landing at NASA's Kennedy Space Center, the astronauts and ground teams were focused on one thing: bringing the storied space plane down safely to end a successful mission. But after landing, when the Discovery's crew emerged from the ship to be greeted by NASA's flight controllers, a gamut of emotions began to sink in. 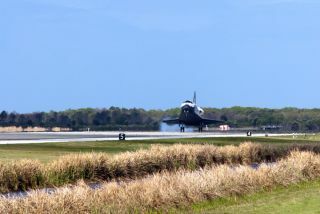 "It's a pretty bittersweet moment," shuttle commander Steve Lindsey said as he stood on the runway following Discovery's picture-perfect final landing. "As the minutes pass, I'm actually getting sadder and sadder about this being the last flight." For mission specialist Nicole Stott, the moment was particularly poignant. Before she joined NASA's astronaut corps to fly in space, she worked to keep the shuttles flying as an engineer at the Kennedy Space Center. "I feel like I have an emotional tie to Discovery, to the space shuttles, and to KSC especially," Stott said. "Walking around under the vehicle, I saw so many familiar faces. The more time I have to talk to more of those people, the more emotional and more of an impact it's going to have." The last crew of shuttle Discovery, the STS-133 astronauts, poses for a photo in front of on the Shuttle Landing Facility's Runway 15 at NASA's Kennedy Space Center in Florida after landing on March 9, 2011. "The vehicle looks really good," Mike Leinbach, NASA's shuttle launch director, said in a post-landing news briefing today (March 9). "It's a good day. Discovery is home safe, the astronauts are down. I was looking in their eyes as they were looking back at the ship, and they had some special feelings, I'm sure." The success of Discovery's STS-133 mission is enough to make its rocky start a distant memory. The mission was delayed several months due to repeated issues with the shuttle's massive external fuel tank. Yet the eventual success of the mission shows the hard work and dedication of those who work in the space shuttle program, Leinbach said. "It just played out the way we wanted it to," Leinbach said. "We wanted to go out on a high note, and Discovery has done that. We couldn't ask for more. It was virtually a perfect mission." And credit for that success belongs to both the astronauts and those who work behind the scenes, NASA officials said. "It's really a testimony to how focused and how diligent the teams are at processing the vehicle," said Bill Gerstenmaier, NASA's associate administrator for space operations. "We talk about finishing strong, and that's exactly what we wanted to do." Astronaut Tim Kopra became an unexpected member of the shuttle's behind-the-scenes team when he was forced to sit out the STS-133 mission after being injured in a January bicycle accident. Steve Bowen, a veteran spacewalker, joined the crew in his place, but Kopra remained involved in the mission by providing support on the spacewalks from Mission Control at NASA's Johnson Space Center in Houston. "He was with us every day, the whole time that we were there – he was a big part of the mission," Lindsey said. "Everything we did, Tim touched. We really wish he could have been with us." Discovery will now be rolled to the Orbiter Processing Facility here at KSC, where teams will begin the months-long task of preparing the vehicle and making it safe for its future life on public display in a museum. And with Discovery's final mission now over, the sadness of the milestone is mixed with pride. Mike Moses, NASA's shuttle launch integration manager, called the mission a triumph for the entire Discovery team. "It's a fantastic mission, a really fantastic vehicle, and a great way for Discovery to end its career," Moses said.